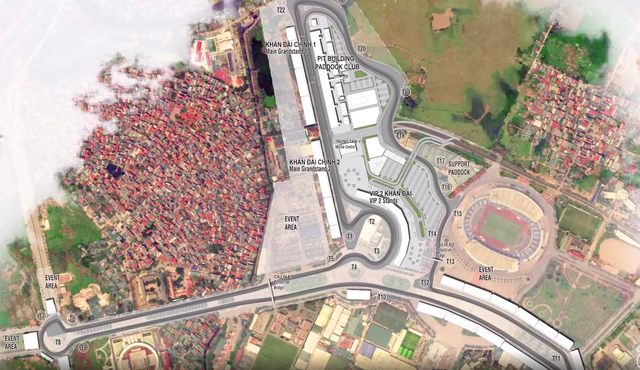 A Vietnamese corporation has expressed its intention to build a large-scale stadium, tourist, and entertainment complex, including a Formula One racetrack, that can house up to 100,000 people in Hanoi. FLC Group has recently submitted a document to the municipal People’s Committee, suggesting that the complex be constructed in either Dong Anh, Me Linh, or Soc Son District in the city’s suburbs. According to Le Thanh Vinh, FLC’s vice-chairman, the primary facility of the project is a stadium with a seating capacity of 100,000 seats, able to host many international games and tournaments. It will be one of the largest and most modern stadiums in the world, Vinh said, adding that there will also be a Formula One racetrack within the stadium. The venue will consist of other facilities including a golf course, hotels, a five-star resort, and multimedia areas designed for international conventions. It will have an entertainment zone, trade and financial center, healthcare center and hospital, international summer camp, horse racetrack and zoo, theme park, and shopping area. The first phase of the construction is expected to cost approximately VND25 trillion (US$1.07 billion), Vinh continued, adding that it will cover an area of 1,000 to 2,000 hectares. If approved by the Hanoi administration, FLC Group will directly invest in the implementation, management, and operation of the complex, the vice-chairman stated. FLC will also focus on linking the complex with nearby projects, especially Noi Bai International Airport, in terms of traffic and technical infrastructure. In early November 2018, Chairman of the Hanoi People’s Committee Nguyen Duc Chung said the capital will host an F1 race in 2020, making Vietnam the 22nd country in the world and third Southeast Asian nation to organize the high-speed sport. While the municipal administration won the bid to host the race, it will have Grand Prix Vietnam, a private entity owned by local conglomerate Vingroup, handle the actual organization of the event. Formula One is the highest class of single-seater auto racing sanctioned by the Fédération Internationale de l'Automobile (FIA), the world governing body for motor sport, and owned by Formula One Group.